My heart doesn’t sink because of the extra work – I don’t mind that if the comments are helpful – but because I know that they probably won’t be. So I now have two choices. 1) Make changes that will be detrimental to the document I worked so hard on creating or 2) get into lengthy explanations about why my client’s friend is mistaken. (I always go for the second option because I can’t bear to do bad things to someone’s resume). Look, I’m not (always) perfect. Sometimes there is a suggestion that improves what I already did. But the document I created was pretty carefully thought through. There were reasons for every decision. There was thought behind each word choice. I left things out. I rearranged information. I created a central theme and then built on it. Then together, the client and I refined the document to iron out inaccuracies, or add missing information. That resume was a little symphony – each part adding up to the whole in a coordinated and carefully planned manner. But now, because some guy has it in his head that resumes should only be one page long, or that you shouldn’t start bullet points with action verbs, I have to address each of his comments. Maybe they do. Or maybe the problem is the lack of understanding about what a professional resume writer actually does. I am always amazed how many people think my job is simply to type up their career history and make it look neat. And frankly, why would they know any different? While our industry has several professional associations, none of them have raised the profile of our industry. None of them have coordinated PR and marketing efforts to let people know what we do, or promoted stringent criteria for membership that tells clients who they can trust. We have some certifications handed out by various groups, but frankly I can’t remember the last time a client asked about them. Very few people know what we do and very few people understand why it’s important. The value of our work is only really understood by most people after they use our services and get a great new job as a result. Is that the reason why some people are willing to hand over hundreds of dollars to a professional, only to put more stock in the comments of a friend or relative? Or is there some other explanation? I think we all feel the same way… it’s not the WORK that I mind doing, it’s the damage that will be done to the document that was tailored to the clients original strategy– because of what one person said. The more educated the clients are on our profession, the more confident they will feel in who they choose, and with the end result. PS – re: credentials: I do get a lot of prospective clients asking me about the MRW credential that I promote — what it really ‘means’ to them. I agree, though, that there could be a better job done by our associations in regard to PR/promoting the value of our experience, credentials and client results – helping individuals ferret out the quality writers/strategists. (In fact, in my role with Career Management Alliance, I should be working on this message, in between building my own biz! 😉 Identifying whom job seekers can “Trust” (as you say) is key to integrate into that message. Matthew, good to know that resume writers are not alone! I bet graphic and web designers run into the same things. Erin and Jacqui, thanks for the comments. I think there’s such room for an aggressive, strong professional association headed up by someone who is amazing at PR. Unfortunately, I am not that person and I don’t know who is. Had one client say she wanted her sister to look at the resume because the sister had an MBA and would know if what was written was her. To say I was flabbergasted is an understatement. If clients want to seek feedback, I think it’s important that they not ask ‘what do you think of this resume?’ but rather ‘does this resume communicate all the skills you know I have?’ Sometimes that feedback can be valuable because it brings out information the client never thought to mention. But it’s only useful when it comes from someone who has worked with you for a decent amount of time. You must deliver (ship as Seth Godin says) great resumes. I say this with conviction based upon your above expose. You said it and then some. Especially about promoting what it is that resume writers, those certified and those that could be certified. In my “practice” I don’t sell or charge for resumes or cover letters. They are produced by others more qualified or in a pinch in full collaboration with the candidate who is encouraged to get other opinions along the way. I shall share your posit with others presuming that is okay with you. Thank you for publishing what you said so well. Thank you, thank you for a spot on blog. 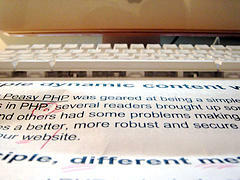 Feedback is helpful but remember who the professional resume writer is…nice little reminder. I gently remind clients that I have reviewed tens of thousands of resumes over 16 years and have written more than I can remember. I also get the latest and greatest advice from the gurus in the industries who serve as my mentors. I sigh and smile to myself when this happens. I have started encouraging clients to have friends and family review their rough draft (early on) for feedback to head off this problem on the back end. I think you made a good point. I think it is important to qualify what you want feedback on. As a Web designer, I want to do a much better job of making feedback objective by explaining my design decisions and asking targeted feedback instead of justing showing a design and asking what do you think. Design is subjective and you are always going to find someone who has an opinion. But I think you hit the nail on the head with your comment. The focus needs to be more on does this communicate my skills. I want to do the same thing with design clients and get them focused on the message and if the solution is solving the problem rather than nit picking other things that are not as important to the success of the project. Great post (as usual), Louise! Education is a big part of our process — but ultimately it boils down to: It doesn’t matter what friends/family think … it matters what that hiring manager, business owner, or recruiter thinks. Louise, great post. I have clients that get their resumes reviewed by others including the ones on the web that do it for FREE and then want to rewrite it for of course a fee. I really hate to see people get taken advantage of and often times this is the case. Higher fees don’t always result in a better resume. I agree that there needs a better way of promoting the business and value of what professional writers can offer.